I know that I’ve been talking about it here a bit, but the past few months have been crazy. And while I know I’m guilty of saying that all the time, this winter and spring have blown other crazy times out of the water. 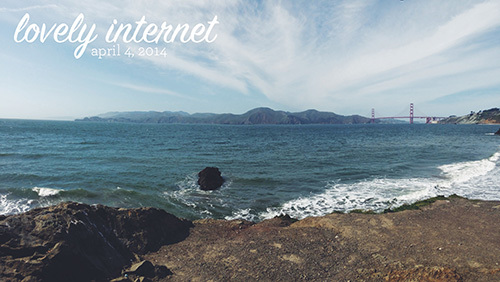 We (or I) have been on the road every weekend since the end of January, and some of the week days (like our recent trip to San Francisco). My months have blurred, projects that need my attention are being ignored, and I feel a little bit less than grounded. I’m barely staying afloat and what I mean by that is, I’m sorry. It’s been months since I’ve had as much time and energy as I’d like to devote to this space, and I know it’s been apparent. That said, things are finally starting to clear up. We have a few more big trips planned in the next few weeks, but things are slowly settling down and I am working to get back to my routine. The wonderful thing is, that in life, things are coming together. My school is moving to a beautiful new space that is giving me the opportunity to build a huge organic fruit and vegetable garden, an orchard, a chicken program, and more (like two pet lionhead bunnies that I’m naming Humphrey Bungart and Ernest Hoppingway THANKS THIS IS THE BEST FOREVER). We’re looking at moving into a new house in a new neighborhood that is still downtown but closer to school and slightly bigger (with more space for a potential studio space), which will hopefully give me the creative inspiration I need to finish a few big projects. Dan finally cut off his pony tail. We’re living the good life over here. While we cheated slightly (sometimes more than slightly) on our April diet while we were in San Francisco, we’ve mostly stuck to the plan. Today, after a lot of green smoothies, apples dipped in peanut butter, and edamame I was ready for something substantial. 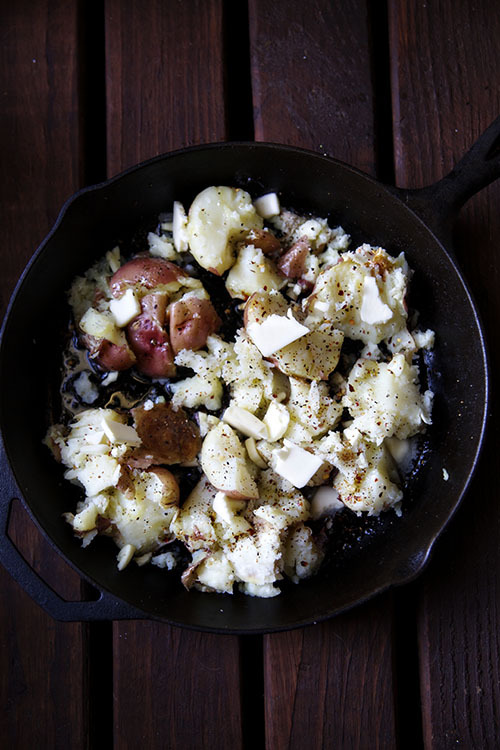 Call in the garlic skillet smashed potato. The basic premise of this masterpiece is- cook a potato, smash it, season it, roast it in high heat for optimal crispness. Paired with sweet and spicy Brussels sprouts and a fried egg this was everything I wanted it to be. Preheat the oven to 350F. 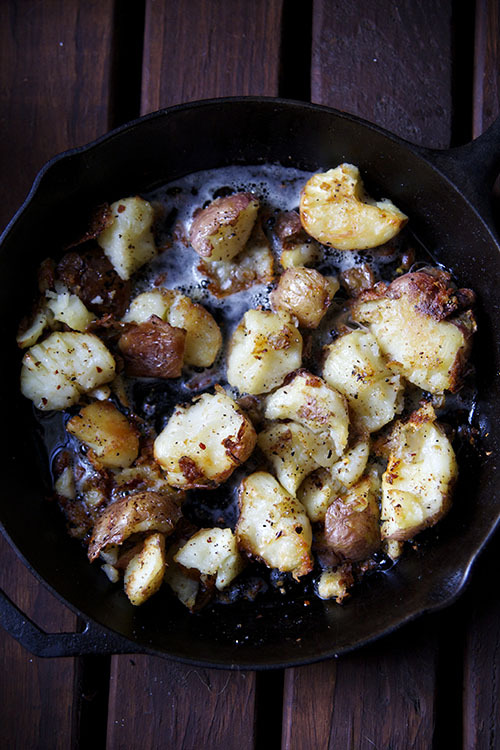 Toss the potatoes in half the olive oil and seasoning. 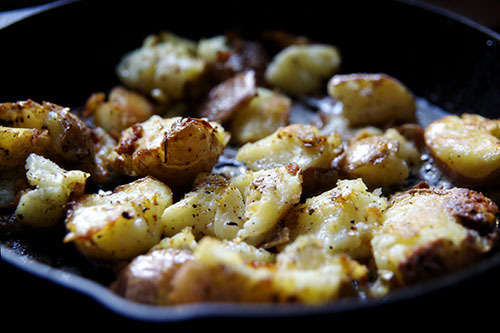 Roast for 30 minutes or until a fork easily penetrates the potato. Let cool to room temperature, then heat the oven to 425F. 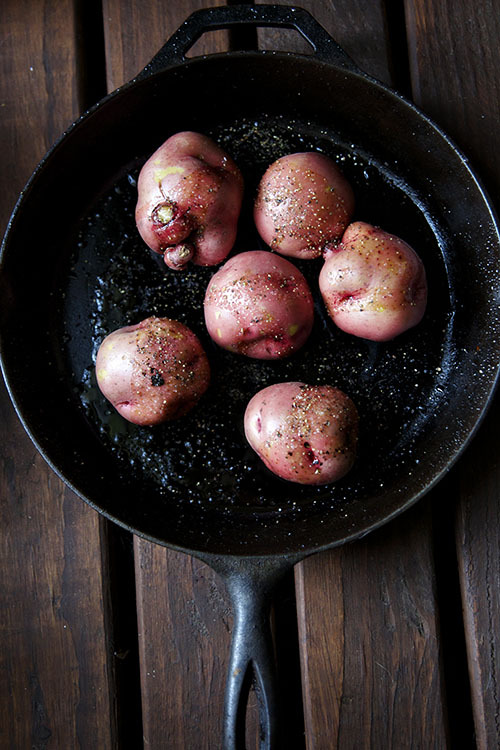 Use a potato masher to smash the potatoes to flat. Top with remaining oil, half of the butter, and seasoning. Cook for 15 minutes. Flip, top with remaining butter, and season. Cook an additional 15 minutes until golden brown and crisp. Serve hot. 1. Who else is craving a mint julep? 2. The truth about gentrification. 3. The oldest living things in the world. 4. Dan and I still quote this video constantly. And, 11 years later, STILL FUNNY. 5. This is a pretty powerful statement. 6. I had breakfast yesterday with Tracy and, much to my delight, my avocado toast and farm fresh egg were both drizzled with sea salt and marash pepper. Have you tried this before? It’s fantastic! 7. Even though I knew this was inevitable, my natural response is still WHAT. 10. I will definitely be making this when I get home next week. It’s Spring! Spring is here! This week was all 70 and 80 degree weather, bright sun, flowers, and sneezes. I’m in heaven. I’m also in San Francisco, but that’s beside the point. This week I hosted Book Club, which meant I fed a group of people that I haven’t cooked for before but who know I write this blog (not to mention the cookbook), which is a scenario that gives me panic attacks. What if they don’t like what I’m serving? What if it’s awful? What if I fail? 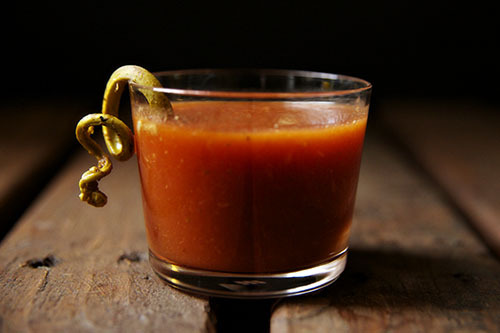 My answer to these questions is to make something I know I do well, so I served up a grits bar and a Bloody Mary bar. And, despite my deepest insecurities, it was a hit. 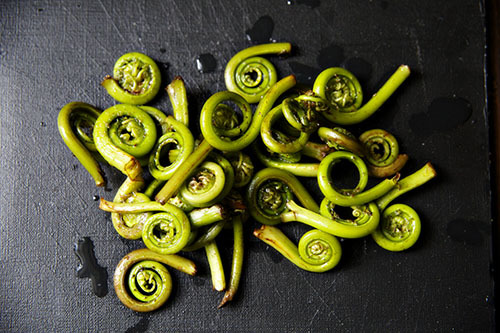 To add a little pizzaz to the Bloody Marys I pickled a batch of fiddlehead ferns, a Spring delicacy on par with ramps and garlic shoots. As my friend Katie described them, they taste like a blend between okra and green beans, the perfect taste of this fleeting season. A season I am whole-heartedly enjoying. Blanche the fiddlehead ferns and rinse in cold water. In a non-reactive saucepan, heat all ingredients to a low boil. Simmer 10-12 minutes. 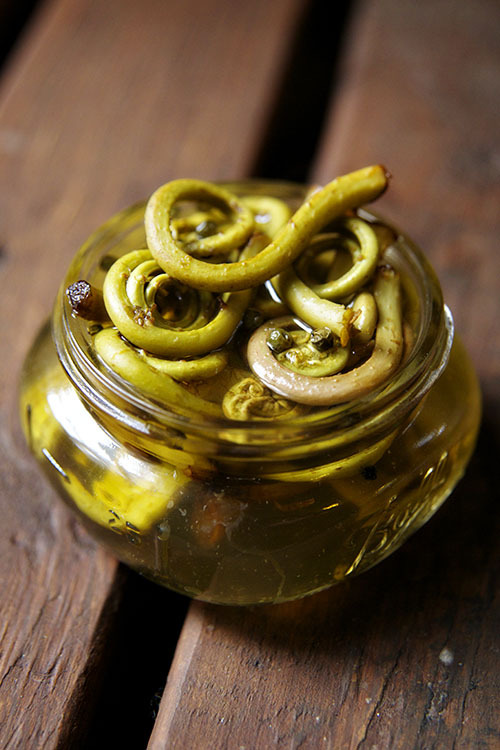 Transfer into a jar/covered dish and store, refrigerated, for up to two weeks. ed note: These ratios make 1/2 pint of pickled ferns. Multiply ingredients as needed. 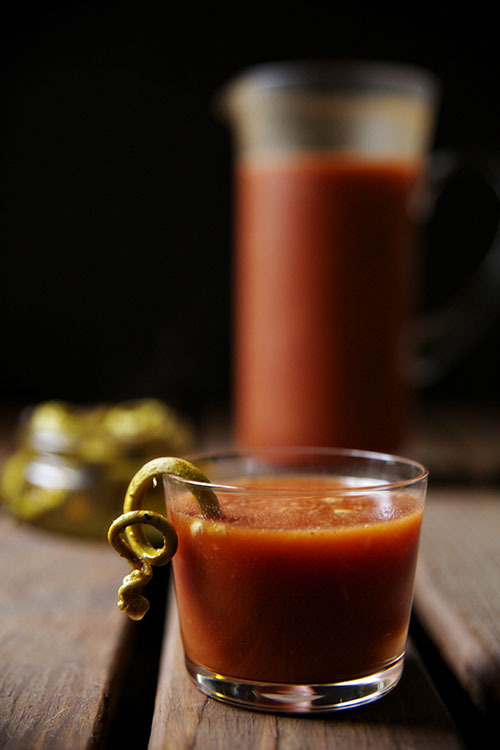 Begin by sterilizing your jar and lid in a pot of hot water. Set aside. Leave the pot of water boiling. Blanche the fiddlehead ferns and rinse in cold water. In your sterilized jar, combine ferns with remaining ingredient. 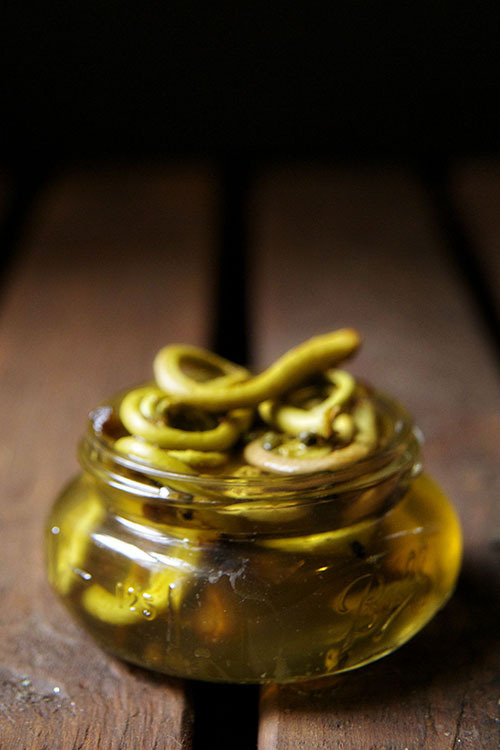 Pour vinegar and salt into jar, wipe the rim down, place a clean lid on the jar, and screw band on tightly. Process in your large pot (with rack) for 10 minutes. Remove from water, give the band another squeeze, and allow to sit. Once the jars have sealed (you’ll know if you can’t pop the lid up and down), set them in a cool, dark place for at least two weeks. They will stay for up to a year.